Carte generale de l'Amerique Meridionale. 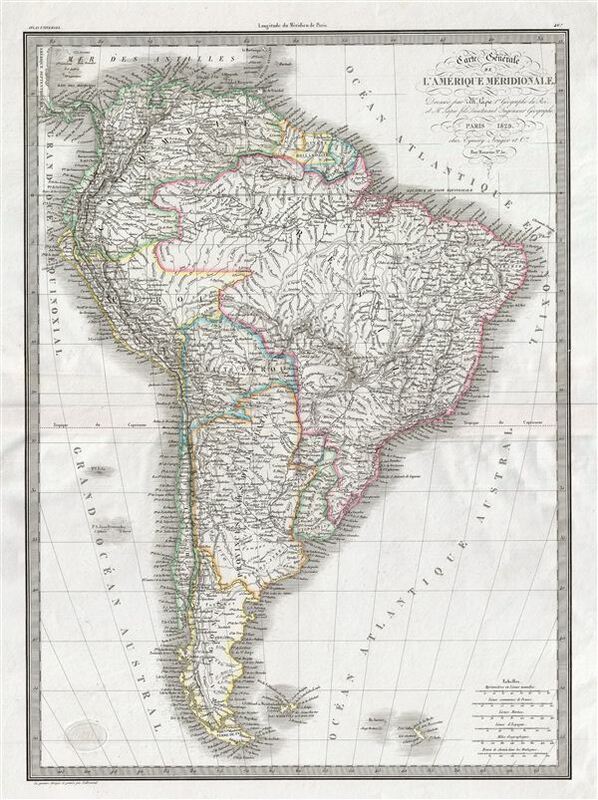 A fine first edition example of M. Lapie's 1829 general map of South America. The map covers entire South America from the Pacific Ocean to the Atlantic Ocean. It shows Colombia, Brazil, Peru, Upper Peru, Chile, French, Dutch and British Guiana, the United Provinces of La Plata, Paraguay, Argentina, Patagonia and the Falkland Islands. During this time in history most of the continent was struggling for independence. The Spanish colonies won their independence in 1823 led by Simon Bolivar of Venezuela and Jose de San Martin of Argentina. In Brazil, Dom Pedro I became first emperor after proclaiming the country's independence in 1822. This map was engraved by Armand Joseph Lallemand as plate no. 46 in the first edition of M. Lapie's important Atlas Universel. This map, like all maps from the Atlas Universel features an embossed stamp from the Lapie firm. Rumsey 2174.046. Phillips (Atlases) 754, 765.